TIVO is a company which sells digital video recorders, also called TIVO, and the programming schedules needed to record your selections. The TIVO device is a computer with built-in hard drive, connected to your TV, which records your TV shows for you. When the TIVO video recorders first arrived they were stand-alone units. You hooked them up to your TV and antenna or cable box and enjoyed TV on your schedule instead of the TV networks schedule. These were the original Series 1 models. Later, some manufacturers started offering the TIVO integrated into their satellite receiver. Still later, the satellite TV companies sold their own integrated DVR/receiver units. The Series 1 and the newer Series 2 stand-alone TIVO models are basically the same size as a typical VCR but contain a hard disk drive to store your video content in digital form. The latest TIVO is the Series 3 model which has High Definition video capability. Hooking up your stand-alone TIVO video recorder (DVR) with your TV is relatively easy. However, if you add a cable box or separate satellite receiver and a VCR, it starts to get involved. Your cable box or satellite receiver must be compatible with the TIVO DVR if you require the TIVO to issue channel changing commands to the cable/satellite tuner/receiver. If you have a digital cable TV box, your TIVO has to change the channels on the cable box in order to automatically record your selections. One method is to connect an infrared emitter to act as a remote control for the cable box. Setting up the proper codes in the TIVO and placing the IR emitter over the cable box's infrared receiver, allows automatic channel changes. So now the problem arises. 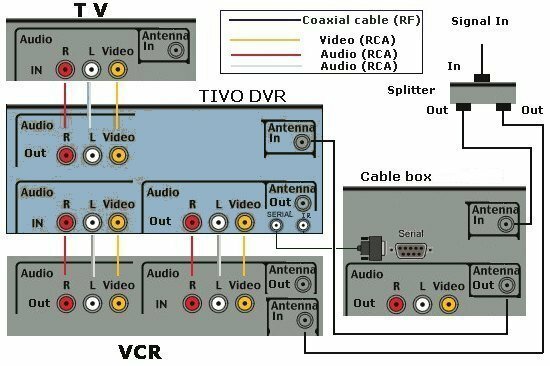 How do I change channels on the cable/satellite de-scrambler box so that the TIVO will record the proper channels as I have designated (or as TIVO has designated) when I am not home or asleep? Another method is to use a Serial cable for channel changes. The TIVO recorder has two ports on the back panel called CONTROL OUT. One is for a serial cable connection and the other is for an IR (infra-red) cable connection. By using one of these connections to your cable/satellite receiver box, the TIVO can send signals to change channels. But just because the TIVO sends the signal to change to a channel does not mean the channel necessarily gets changed. Your cable/satellite box has to recognize the TIVO codes. Some cable/satellite receiver boxes have a serial port on the back panel, but if not, you have to use the IR connection. This results in a less than elegant setup because you must place the IR emitters over the IR (remote control) sensor in the cable/satellite receiver. Room dynamics can cause interference with the IR signals and this can result in the wrong channel or no channel change sometimes. A covering over the emitter and sensor can improve results. You must configure, within the TIVO menus on-screen, your specific configuration so the proper codes are sent. Any changes made by the TIVO company such as upgrades or changes made by the cable or satellite companies to receivers could create a situation whereby channels no longer change correctly. With TiVo, you can pause, rewind, slow-motion and even instant replay live TV, anytime. Your digital video recorder with TiVo connects easily between your TV set and cable box (digital or analog), VCR, and/or antenna. 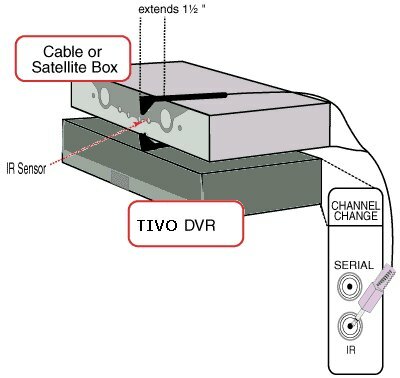 To view TV programs and access TiVo’s programming ability, you’ll need four RF/coaxial cables, one signal splitter, and two phone cables, plus three Audio/Video sets of cables (composite video and stereo audio). Run one RF/coax cable from your Cable TV/ Antenna wall outlet to the signal splitter. Run a second RF/coax cable from the splitter to the VCR RF input, so you can watch TV using the tuner in either your cable box or VCR. Run a third RF/coax cable from the splitter to your cable box, and a fourth RF/coax cable from the cable box output to your Digital Video Recorder RF input. Only the cable box can de-scramble digital channels and then pass them to the TIVO. Regular unscrambled analog channels, if any, can be handled by the tuner in the cable-ready VCR. For playback from your TiVo (to your TV), you’ll need an audio/video 3 cable hookup (RCA); one video cable and an audio pair (left/right). 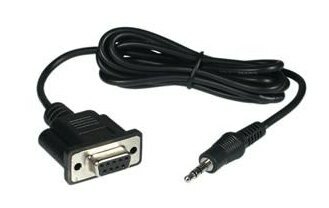 To record from your TiVo to your VCR, for archival purposes etc., you’ll need another audio/video 3 cable hookup; one video cable and an audio pair (left/right). 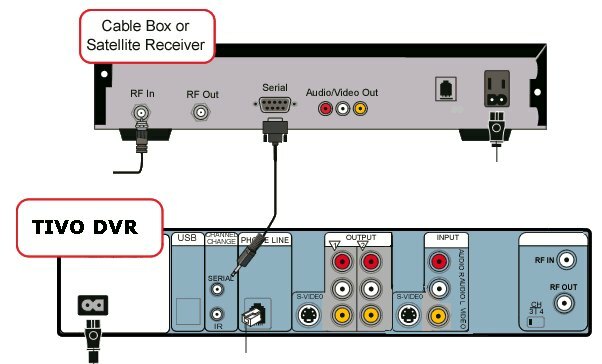 To play back from your VCR, you’ll need another audio/video 3 cable hookup as shown in the diagram below.